Image: Marvel. Art by Brian Stelfreeze. io9 senior writer Evan Narcisse has been writing about comics for over a decade, but over the past several months, you may have noticed his thoughtful essays on the Big Two comics publishers are missing. That’s because Evan has gone from writing about comics to writing one himself—namely, Rise of the Black Panther, a new series looking at the formative years of the Marvel hero. io9: How did Rise of the Black Panther come about? Were you trying to moonlight on me? Narcisse: The project came about when I got a text from Ta-Nehisi [Coates]. After reading a really in-depth interview I did about his run on the title, editor Wil Moss asked him to reach out to see if I’d be interested in working on a Black Panther project. Is this sort of a Black Panther: Year One? Narcisse: Don’t give the Distinguished Competition’s legal department a reason to look for me, Rob... but yes, this is essentially the story of T’Challa’s first year as king, where he makes the decision to end centuries of secrecy and let the world know about Wakanda. It’s a choice that angers many in Wakanda and attracts the attention of the global community on Earth-616. How are you closely are you working with Ta-Nehisi Coates on this, and how much will it connect to his main Black Panther series? Narcisse: Most of the major plot beats are coming from me. Once we all agreed on the shape of the story arc, I’ve been in constant contact with Ta-Nehisi about ways for this series to reflect who T’Challa is in the present day. There’s a bit of thematic irony here because Ta-Nehisi’s first story arc involved an instance of change where T’Challa represented the historical status quo. In Rise of the Black Panther, he’s the one rebelling against what’s always been done. He goes from being a rebel of sorts to being the establishment. Any cool tidbit you can tell me about the series without Marvel’s legal department a reason to look for you? Narcisse: I want to show a little window of how Wakandan technology has evolved over the decades. There may or may not be giant Panther mechs by the time this is all done. Seriously, how excited are you to basically be creating Black Panther’s formative years? Narcisse: Man, I can’t overstate how excited I am to writing this particular storyline. The Black Panther has always been my favorite superhero character. The first issue focuses on a character that I’ve wondered about for ages as a fan and now I get to be the one to breathe life into that persona. What else do you want people to know about Rise? 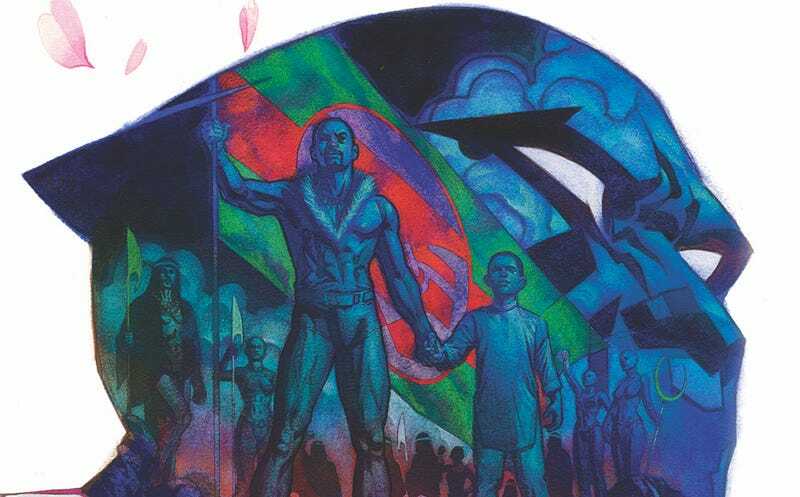 One of the questions that faces black comics fans, critics, creators—or those from other marginalized groups—is this quandary of what to do with what we’ve inherited. The characters with messy, contradictory, well-meaning executions and fondly remembered embarrassments. How do you pull that into the future so that it’s something that’s enjoyable, something that can survive and thrive? It’s a question I dealt with in my career and T’Challa faces it, too, in a different way. Rise of the Black Panther #1 comes out in January 2018, and may or may not include giant panther mechs.